In just a few days we celebrate Palm Sunday, when we hear at the beginning of Mass the Gospel story of Jesus’ joyful entry into Jerusalem. We also hear the Gospel writer Mark’s account of our Lord’s Passion — from the Last Supper, to Jesus’ agony in the garden and betrayal, to his trial, walk to Calvary and death on the cross. It ends with Jesus being placed in the tomb, where a stone is rolled in front of the entrance. It’s hard to imagine — even by Hollywood standards — a better cliffhanger than that. Could this be the end of the story for the one sent by the Father? For the one who preached about the kingdom of God with such powerful messages of mercy, love and forgiveness? For the one who promised eternal life for all those who believed in him? As Christians, we know that Good Friday isn’t the end of the story. Easter brings the promise of new life and reminds us that Christ — and Christ working through us — has the power to redeem and transform our lives and our world. Lent is a time in which we strive to grow closer to Christ, to deepen our commitment to discipleship through prayer, fasting, charity and penance. I know the journey to the joy of Easter isn’t always easy. This Lent, in particular, has been difficult because of news of the arrest of one of our priests and the announcement of the diocese’s intention to file for bankruptcy reorganization to settle past claims of clergy sexual abuse. Please join me in praying for a fair and just resolution to these matters. I will keep you informed about them as best I can. I also have another request for the Easter season: Please continue the efforts you began in Lent to enrich your faith and grow closer to Christ. 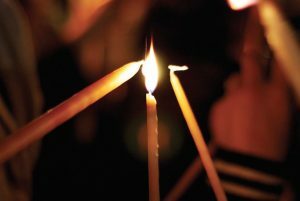 The Easter season is a time when those who will be fully initiated into the church at the Easter Vigil enter the period of “mystagogy” — a time for further instruction and formation in the church’s sacramental mysteries. While we accompany new members of the church as they begin this new life of faith, it can also be a time for each and every one of us to again renew our own baptismal promises, deepen our experience of faith and witness to it more intentionally in our daily lives, including in our interactions and outreach to others. I encourage you to actively engage the new members of your parish community — former catechumens and candidates — so they feel welcomed and involved. Invite them to coffee after Mass, to dinner, to a retreat or ongoing formation experience at your parish or cluster. You will be helping them and deepening your own encounter with Christ and the sacred mysteries. I ask you, too, at this time of the year especially, to keep in prayer our candidates for confirmation. I will be visiting many parishes over the next several weeks to administer this sacrament of initiation, in which the youth will receive the gifts of the Holy Spirit to strengthen them in their life of faith. They need our support and encouragement so that they can be energetic and enthusiastic evangelizers for our church today and into the future. 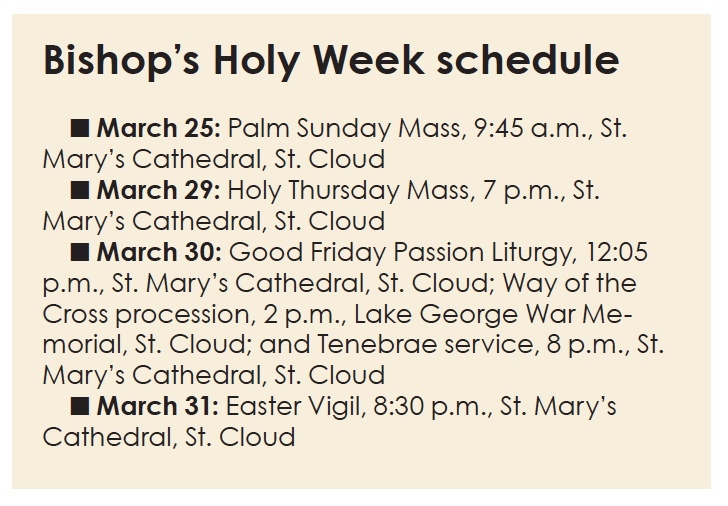 So as we look ahead to our celebration of Holy Week and the Easter Triduum, let’s remember that our local church here in central Minnesota remains strong. We will get through the challenges we face together. And we can look to Christ, who defeated darkness and death by rising from the dead, for the hope and promise that is ours. May you and your loved ones have a blessed Holy Week and Easter season.